Area of the Fertile Crescent, circa 7500 BC, with main archaeological sites of the Pre-Pottery Neolithic period. At that time, the area of Mesopotamia proper was not yet settled by humans. The development of Mesopotamia in the 7th–5th millennium BC was centered around the Hassuna culture in the north, the Halaf culture in the northwest, the Samarra culture in central Mesopotamia and the Ubaid culture in the southeast, which later expanded to encompass the whole region. The Fertile Crescent was inhabited by several distinct, flourishing cultures between the end of the last ice age (c. 10,000 BC) and the beginning of history. One of the oldest known Neolithic sites in Mesopotamia is Jarmo, settled around 7000 BC and broadly contemporary with Jericho (in the Levant) and Çatal Hüyük (in Anatolia). It as well as other early Neolithic sites, such as Samarra and Tell Halaf were in northern Mesopotamia; later settlements in southern Mesopotamia required complicated irrigation methods. The first of these was Eridu, settled during the Ubaid period culture by farmers who brought with them the Samarran culture from the north. This was followed by the Uruk period. Named after the Sumerian city of Uruk, this period saw the emergence of urban life in Mesopotamia. It was followed by the Sumerian civilization. The late Uruk period (34th to 32nd centuries) saw the gradual emergence of the cuneiform script and corresponds to the Early Bronze Age; it may also be called the "Protoliterate period". Administrative tablet in Proto-cuneiform, Jemdet Nasr period 3100–2900 BC, probably from the city of Uruk. Golden helmet of Meskalamdug, possible founder of the First Dynasty of Ur, 26th century BCE. For two centuries of Achaemenid rule both Assyria and Babylonia flourished, Achaemenid Assyria in particular becoming a major source of manpower for the army and a breadbasket for the economy. Mesopotamian Aramaic remained the lingua franca of the Achaemenid Empire, much as it had done in Assyrian times. Mesopotamia fell to Alexander the Great in 330 BC, and remained under Hellenistic rule for another two centuries, with Seleucia as capital from 305 BC. In the 1st century BC, Mesopotamia was in constant turmoil as the Seleucid Empire was weakened by Parthia on one hand and the Mithridatic Wars on the other. The Parthian Empire lasted for five centuries, into the 3rd century AD, when it was succeeded by the Sassanids. After constant wars between Romans and first Parthians, later Sassanids; the western part of Mesopotamia was passed to the Roman Empire. Christianity as well as Mandeism entered Mesopotamia from the 1st to 3rd centuries AD, and flourished, particularly in Assyria (Assuristan in Sassanid Persian), which became the center of the Assyrian Church of the East and a flourishing Syriac Christian tradition which remains to this day. A number of Neo-Assyrian kingdoms arose, in particular Adiabene. The Sassanid Empire and Byzantine Mesopotamia finally fell to the Rashidun army under Khalid ibn al-Walid in the 630s. After the Arab-Islamic conquest of the mid-7th century AD, Mesopotamia saw an influx of non native Arabs and later also Turkic peoples. The city of Assur was still occupied until the 14th century, and Assyrians possibly still formed the majority in northern Mesopotamia until the Middle Ages. Assyrians retain Eastern Rite Christianity whereas the Mandaeans retain their ancient gnostic religion and Mesopotamian Aramaic as a mother tongue and written script to this day. 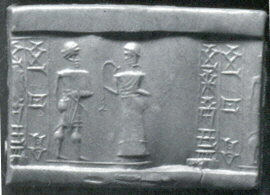 Among these peoples, the giving of traditional Mesopotamian names is still common. ^ This page will use Mesopotamia in its widest geographical and chronological sense. ^ This page will use the Middle Chronology. Bahrani, Z. (1998). "Conjuring Mesopotamia: Imaginative Geography a World Past". In Meskell, L. (ed.). Archaeology under Fire: Nationalism, Politics and Heritage in the Eastern Mediterranean and Middle East. London: Routledge. pp. 159–174. ISBN 978-0-415-19655-0. Brinkman, J.A. (1977). "Appendix: Mesopotamian Chronology of the Historical Period". In Oppenheim, A.L. (ed.). Ancient Mesopotamia: Portrait of a Dead Civilization. Chicago: University of Chicago Press. pp. 335–348. ISBN 0-226-63186-9. Canard, M. (2011). "al-ḎJazīra, Ḏjazīrat Aḳūr or Iḳlīm Aḳūr". In Bearman, P.; Bianquis, Th. ; Bosworth, C.E. ; van Donzel, E.; Heinrichs, W.P. (eds.). Encyclopaedia of Islam, Second Edition. Leiden: Brill Online. OCLC 624382576. Miquel, A.; Brice, W.C.; Sourdel, D.; Aubin, J.; Holt, P.M.; Kelidar, A.; Blanc, H.; MacKenzie, D.N. ; Pellat, Ch. (2011). "ʿIrāḳ". In Bearman, P.; Bianquis, Th. ; Bosworth, C.E. ; van Donzel, E.; Heinrichs, W.P. (eds.). Encyclopaedia of Islam, Second Edition. Leiden: Brill Online. OCLC 624382576. Muhesen, Sultan (2002). "The Earliest Paleolithic Occupation in Syria". In Akazawa, Takeru; Aoki, Kenichi; Bar-Yosef, Ofer (eds.). Neandertals and Modern Humans in Western Asia. New York: Kluwer. pp. 95–105. doi:10.1007/0-306-47153-1_7. ISBN 0-306-47153-1. Solecki, Ralph S. (1997). "Shanidar Cave". In Meyers, Eric M. (ed.). The Oxford Encyclopedia of Archaeology in the Ancient Near East. 5. New York: Oxford University Press. pp. 15–16. ISBN 0-19-506512-3. Woods, Christopher (2006). "Bilingualism, Scribal Learning, and the Death of Sumerian". In Sanders, S.L. (ed.). Margins of Writing, Origins of Culture (PDF). Chicago: University of Chicago Press. pp. 91–120. Woods, Christopher (2010). "The Earliest Mesopotamian Writing". In Woods, Christopher (ed.). Visible Language: Inventions of Writing in the Ancient Middle East and Beyond (PDF). Oriental Institute Museum Publications. 32. Chicago: University of Chicago. pp. 33–50. ISBN 978-1-885923-76-9. Simpson, St. John (1997). "Mesopotamia from Alexander to the Rise of Islam". In Meyers, Eric M. (ed.). The Oxford Encyclopedia of Archaeology in the Ancient Near East. 3. New York: Oxford University Press. pp. 484–487. ISBN 0-19-506512-3. A referendum was held in Mandatory Iraq between 16 July and 11 August 1921 to determine the form of government and head of state. History of MesopotamiaOnly the first two collections — those from Egypt and Assyria — were published. Anthemusias (Greek: Ανθεμουσιάς) or Charax Sidae was an ancient Mesopotamian town, according to Pliny and Strabo. Isidore of Charax says that it was 8 schoeni from Apamea near the Euphrates on the road to Seleucia, and Ptolemy places it “at the foot of a mountain called Caspius".The city was founded by one of the early Seleucids and, according to Ptolemy, was situated next to Apameia. "Tiridates meanwhile, with the consent of the Parthians, received the submission of Nicephorium, Anthemusias and the other cities, which having been founded by Macedonians, claim Greek names, also of the Parthian towns Halus and Artemita. There was a rivalry of joy among the inhabitants who detested Artabanus, bred as he had been among the Scythians, for his cruelty, and hoped to find in Tiridates a kindly spirit from his Roman training." This conquest by Tiridates III in 35 CE over Artabanus II was short-lived as Artabanus soon returned from Hyrcania with an army of Dahae Scythians. However, he was forced to accept a treaty with the Lucius Vitellius, the Roman governor of Syria, in 37CE, in which he gave up all power. Egypt-Mesopotamia relations seem to have developed from the 4th millennium BCE, starting in the Uruk period for Mesopotamia and the Gerzean culture of pre-literate Prehistoric Egypt (circa 3500-3200 BCE). Influences can be seen in the visual arts of Egypt, in imported products, and also in the possible transfer of writing from Mesopotamia to Egypt, and generated "deep-seated" parallels in the early stages of both cultures. The First Dynasty of Ur was a 26th century-25th century BCE dynasty of rulers of the city of Ur in ancient Sumer. It is part of the Early Dynastic period III of the History of Mesopotamia. It was preceded by the earlier First dynasty of Kish and First Dynasty of Uruk. Georges Raymond Nicolas Albert Roux (French: [ʁu]; November 16, 1914 – August 12, 1999) was a French writer, author of the popular history books about the Ancient Near East, Ancient Iraq and La Mésopotamie. Son of a French Army officer, Roux moved with his family to the Middle East at the age of nine where he subsequently lived for 12 years in Syria and Lebanon before returning to France in 1935. Roux was educated by Jesuits in Beirut and studied medicine at the University of Paris, where he graduated in medicine in 1941 and later studied Oriental studies at École pratique des hautes études. In 1950 Roux became a medical officer for the Iraq Petroleum Company (IPC) as a medical officer, spending his first two years in Qatar and the remainder in Iraq. During his time with the IPC the company produced the magazines Iraq Petroleum and The Crescent, and Roux was commissioned to produce articles. Through the duration of 1956-1960, Roux published a series of articles, The Story of Ancient Iraq. They form the basis of his later books.After the 14 July Revolution of Iraq in 1958, Roux returned to Europe and headed the International medical department at GlaxoWellcome, retiring in 1980. In 1964, he published in English Ancient Iraq, a book covering the political, cultural, and socioeconomic history of Mesopotamia. In 1985 he published a fuller French work, La Mésopotamie, but the English book's third edition, of 1992, has further enhancements. Khvārvarān, was a military quarter of the Sasanian Empire. Intensive irrigation agriculture of the lower Tigris and Euphrates and of tributaries such as the Diyala and Karun formed the main resource base of the Sassanid monarchy. Michael Gregory Morony (born September 30, 1939) has been a professor of history at UCLA since 1974, with interests in the history of Ancient and Islamic Near East.Morony was born in 1939 in Sacramento. He holds a BA in Near Eastern Languages from the University of California, Berkeley, and an MA in Islamic Studies and a PhD (1972) in History from the University of California, Los Angeles. His dissertation, originally advised by Gustave von Grunebaum, was concerned with the history of Mesopotamia after the Islamic Conquests. The edited dissertation was later published as Iraq After the Muslim Conquest. Upon von Grunebaum's death, his dissertation was supervised by Nikki Keddie. In addition to these scholars, Morony has also worked with W. B. Henning in Berkeley and M. A. Shaban.Morony's research is mostly concerned with the economic history of the Near East, North Africa and Muslim Spain. He has written many articles on the subject and is considered one of the authorities on the socio-economic history of the region in the pre-modern period. The Battle of Singara was fought in 348 between Roman and Sassanid Persian forces. The Romans were led in person by Emperor Constantius II, while the Persian army was led by King Shapur II of Persia. It is the only one of the nine pitched battles recorded to have been fought in a war of over twenty years, marked primarily by indecisive siege warfare, of which any details have been preserved. The Romans were decisively defeated, suffering heavy casualties. The Siege of Singara took place in 360, when the Sasanian Empire, under Shapur II, besieged the town of Singara, held by the Roman Empire. The Sasanians successfully captured the town from the Romans.The wall was breached after some days by battering ram, and the town fell. The 1st Flavian and 1st Parthian legions which had formed the garrison, as well as the inhabitants of Singara, were sent into captivity in Sasanid Persia. Singara (Greek: τὰ Σίγγαρα, tà Síngara) was a strongly fortified post at the northern extremity of Mesopotamia, which for a while, as it appears from coins found, was occupied by the Romans as an advanced colony against the Persians. It was the camp of legio I Parthica. The Uruk period (ca. 4000 to 3100 BC) existed from the protohistoric Chalcolithic to Early Bronze Age period in the history of Mesopotamia, following the Ubaid period and succeeded by the Jemdet Nasr period. Named after the Sumerian city of Uruk, this period saw the emergence of urban life in Mesopotamia and the Sumerian civilization. The late Uruk period (34th to 32nd centuries) saw the gradual emergence of the cuneiform script and corresponds to the Early Bronze Age; it may also be called the Protoliterate period. It was during this period that pottery painting declined as copper started to become popular, along with cylinder seals.